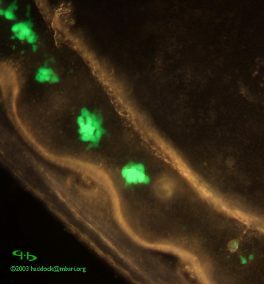 The green-fluorescent protein (GFP) of the hydromedusa Aequorea victoria is used widely for laboratory, clinical, and molecular applications. In the medusa itself, the protein is used to redirect energy from the photoprotein, which would normally emit blue light, to a longer wavelength green light. 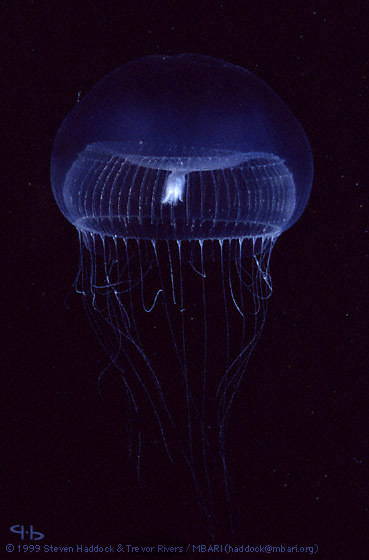 Although you may sometimes see photo captions that erroneously claim the entire jellyfish is glowing, this is not true. In living specimens such as this, GFP is actually located in discrete spots around the bell margin. Claudia Mills has created an excellent page dispelling many false notions about GFP in Aequorea.